It is rare for a small college town as Columbia in Missouri to be visited by so many renowned classical musicians on a single weekend event. Thanks to the generous support of our donors and Columbian community, Plowman Chamber Music Competition draws about 70 performers in one weekend. These world-class musicians include the three Plowman judges, guest Odyssey performers, and 15 nationally selected prestigious chamber ensembles. As Artistic Director, I am privileged to take advantage of Plowman Competition and with the help of Edward S. Rollins at First Baptist Church, Director Dr Julia Gaines at the University of Missouri (MU) School of Music, Nancy Griggs, Past-President of Missouri Symphony Society (MOSS), Dr. Mun Choi, the President of the University of Missouri System, Robert Wells at the University Concert Series, Odyssey and MOSS Board members, many, MANY friends and colleagues, we are collaborating to co-present the Plowman Competition as the ultimate, once-in-a-lifetime 5-day music festival. 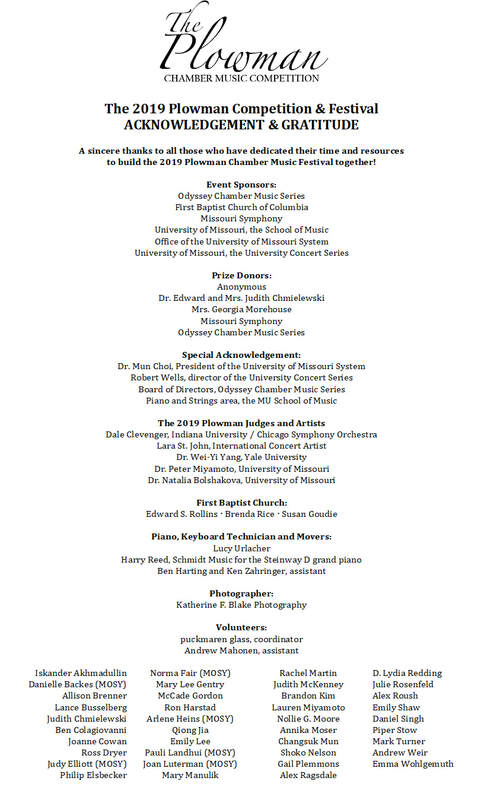 The 2019 Plowman Competition & Festival is also sponsored by the Missouri Symphony League, Mid-Missouri Area Music Teachers Association (MMAMTA), Missouri Arts Council, Office of Cultural Affairs, and Columbia Daily Tribune.